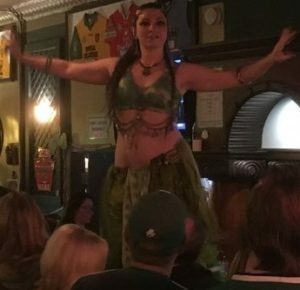 The Parade Day Celebration at Riley’s Pour House topped all expectation — a veritable three-ring wonder featuring entertainment under the big top, in the pub, and even (when the famed Irish Belly Dancers arrived) on the bar. If you were part of the multitude in attendance, you know what I’m talking about. If you weren’t, you’ll get a chance to make up for that next weekend, when we do it all again for St. Patrick’s Day weekend. Even before the parade concluded downtown, people began gathering at Riley’s, quickly filling both the pub and the giant tent erected in the adjacent courtyard. By the time John Gallagher took the tent stage at noon, both spaces seemed filled to capacity. But people kept coming, spilling onto the patio behind the pub and even (despite the cold) onto the sidewalk along Main Street. The trad-duo Dan & Dave warmed the indoor stage for us. Accompanied by a guest fiddler (above), Dan & Dave played from 1:00 – 6:00 while John and Mike Gallagher traded the spotlight on the outdoor stage. Connolly-Davis took over the indoor stage at 6:00 and performed a two-hour set until Lauren Moore arrived to join in on mandolin and vocals. 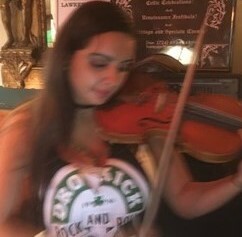 After that, the three of us played the rest of the night, performing for an enthusiastic crowd while The Wild Geese Band played next door. Next weekend, Dan & Dave, Mike Gallegher, and Connolly-Davis return for another two-day party. 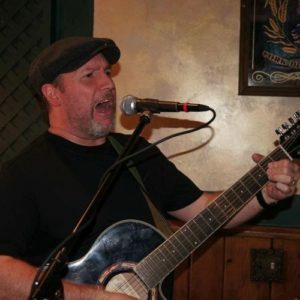 Mark Guiser (right) will also be on hand in the big tent, playing opposite Connolly-Davis, who will be finishing out the weekend on the pub stage. You’ll want to be there for all of it. Otherwise, you’ll have to be content with listening to the stories, which given the Caltic penchant for craic, might be almost as entertaining. Almost. This entry was posted on Sunday, March 12th, 2017 at 5:45 pm and is filed under 21st-Century Scop. You can follow any responses to this entry through the RSS 2.0 feed. You can leave a response or trackback from your own site. Powered by WordPress and delivered in 0.223 seconds using 48 queries.